In response to the April 25 letter "Graffiti creators should be caned": I, too, see the problem of graffiti growing with each passing day.The problem with this letter is that it shows a large amount of discrimination and corporal punishment. We have come too far from the days of public whippings and illegal search and seizure for us to fall back to that type of society. Would it be fair or legal for law-abiding drivers to be pulled over and questioned about graffiti simply because they are out late at night? I disagree with the letter writer's ideas of punishment. Yes, make tougher laws. Yes, enforce those laws. No, do not discriminate as to whom you search or the reasons you search them. We no longer live in the Stone Age. 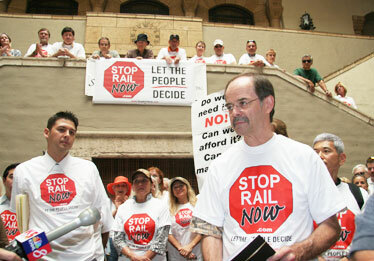 At the Stop Rail Now rally on April 21 at City Hall, Dan Douglas, left, and Dennis Callan announced a petition signing campaign to stop rail. When will the anti-rail people admit that adding a HOT lane along H-1 would destroy Aiea, Pearl City and Waipahu? Speaking as a civil/transportation engineer, this is why erecting a two- or three-lane-wide viaduct on six-foot-wide piers, like the one in Tampa, would require closing four lanes -- half the width of H-1-- while the project is built. Commuting from Ewa to Honolulu would become impossible. The Tampa project was feasible because the highway median was sufficiently wide to allow construction without seriously disrupting traffic. The only feasible answer is to buy up houses along H-1 and add lanes to restore the capacity lost during construction. There is neither the money nor political will to do this. Moreover, adding two or three carpool lanes to H-1 would not accommodate future growth, much less relieve congestion. At peak use, a two-lane HOT lane might move 6,000 people in cars per hour--at 30 mph. By comparison, the rail line could carry at least 12,000 people an hour, who can be productive as they travel. Let's not drown in concrete and exhaust fumes. Support rail. I am greatly disappointed in the non-performance of the City Council in regard to the fixed rail project (Star-Bulletin, April 24). I support the rail system but feel very sorry for the residents who will be exposed to the noise, vibration and harshness of steel wheels against steel rails. Maglev trains are in use between downtown Shanghai and the airport, thus proving that those who say that the technology is untested and unproven are lying so much that their noses grow. Now Mayor Mufi Hannemann gets to impose a faulty solution on the beleaguered Oahu taxpayers. I seriously doubt that the mayor and the City Council members live anywhere near the proposed rail routes, so they will never have to suffer the fruits of their ignorance. Live near your job? What a great idea! Smokey Guerrero (Letters, April 23) has it so right. He suggests, "Instead of an expensive rail system that will serve such a small segment of the population, suppose the population was paid to move within walking distance to work or school." in Ewa, move to Manoa. If you live in Kapolei and work at the Waialae Golf Course, buy a home in Kahala. My wife and I live in Makakilo. I work at Ala Moana and she works in Hawaii Kai. That's it then, we are going house hunting for two places this weekend. Hey, if living separately will help ease the traffic, we are more than willing to do it. Dennis Callan is leading a petition to stop rail for the city's $3.7 billion mass-transit system. His first name was misspelled in a photo caption on this page.